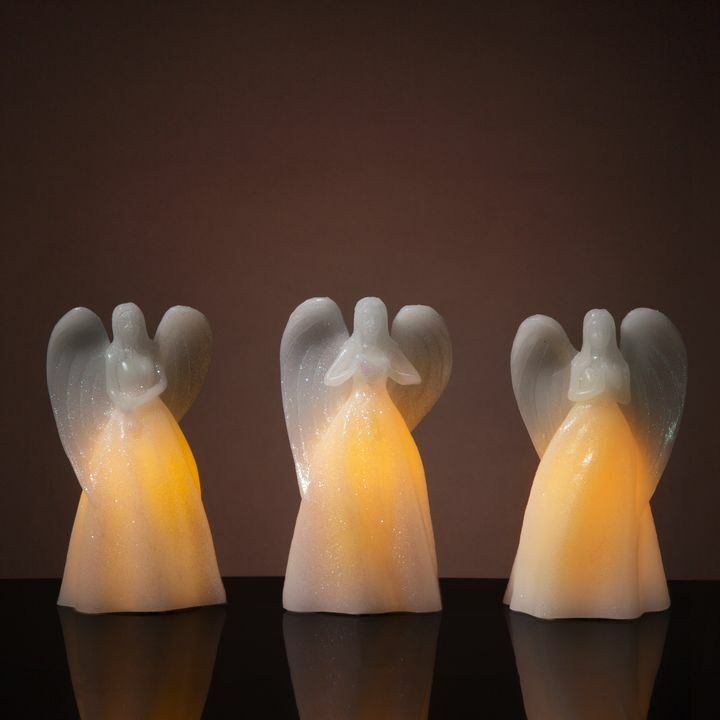 There are only 58 available of the Florence White 7" Drip Resin Flameless Taper Candles, Set of 96. Your selected quantity has been adjusted. 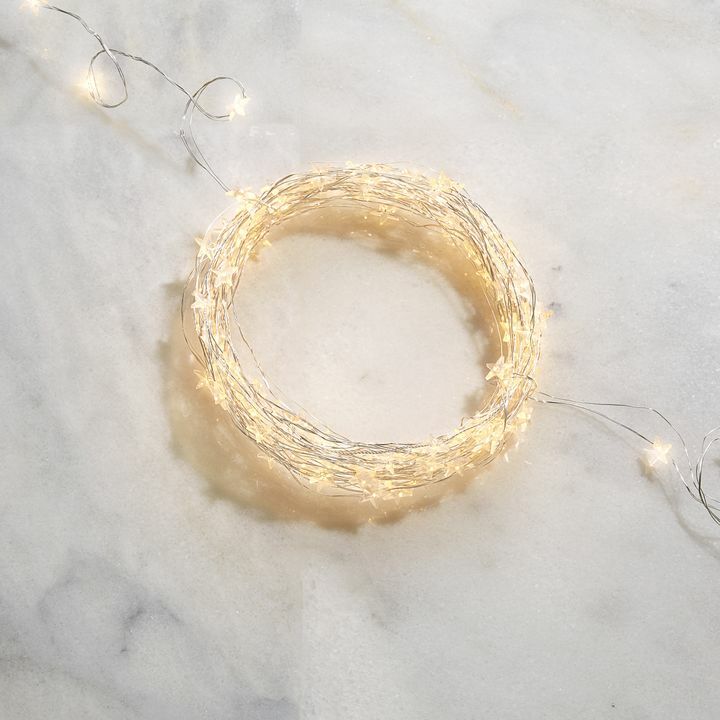 This set of ninety-six white resin, 7" tapers features a life-like drip effect and a warm, glow that mimics the natural movement of a traditional candle. Enjoy the warm ambiance, during the holidays or all year round, without the mess of wax drippings or worry of an open flame. Includes a remote for setting modification from a distance. Perfect for home, weddings, churches, restaurants, and events. 1" x 1" x 7"
I like the size of the candles, the fact that they come with a remote with options and timer settings and batteries, but one of the candle flames was broken, but didn't prevent the light from working and another one stays on and can't be turned off by the remote or by loosening the base. This is just the first weekend, so I'm not convinced they are a quality product. I love my new battery-powered LED candles! 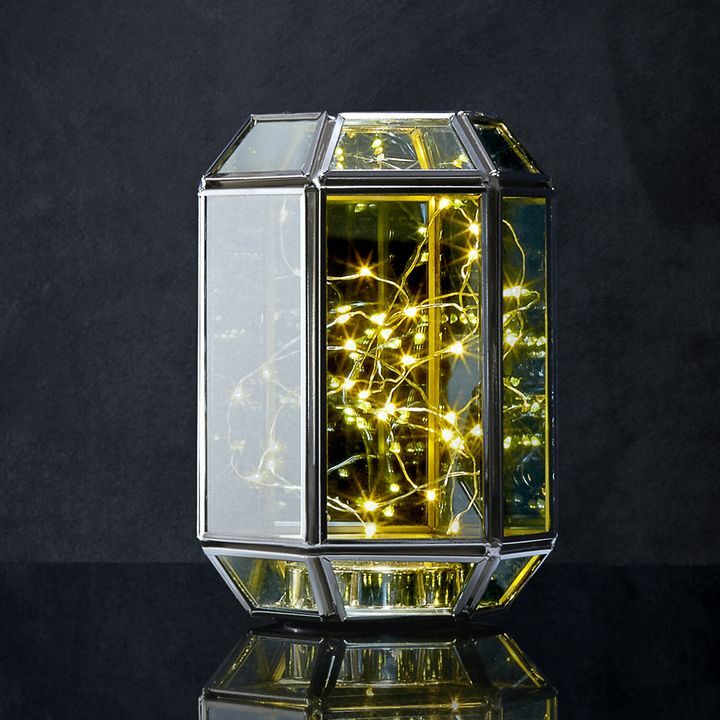 I've been wanting cordless candles for my windows for quite awhile, but couldn't find affordable ones that were also bright enough to be seen outside. These are all of that and more. The remote is a delightful bonus. I couldn't be happier! LOVE these lights. I have them in sconces over the fireplace where it is not possible to reach with out a step stool or ladder. The remote is just wonderful and works very well. I was also impressed that batteries were included with the purchase as we all well know what those are running these days. Very, very happy with the product. The quality was better then I expected! I didn't realize until after I received my order that they had a remote! They have a warm glow also. Just all around a great purchase! Just what I ordered. Great product. Nice but a little too yellowish when lite. Needed faux candles for my chandelier and they are perfect. If they are anything like those I ordered for the standing candelabra for our church's Maundy Thursday Watch, I know they will be perfect! No drips, no mess, and a quite realistic "flame". Will these candles turn on w/o the remote? Can they turn on just by screwing on the end piece that holds the batteries in place? 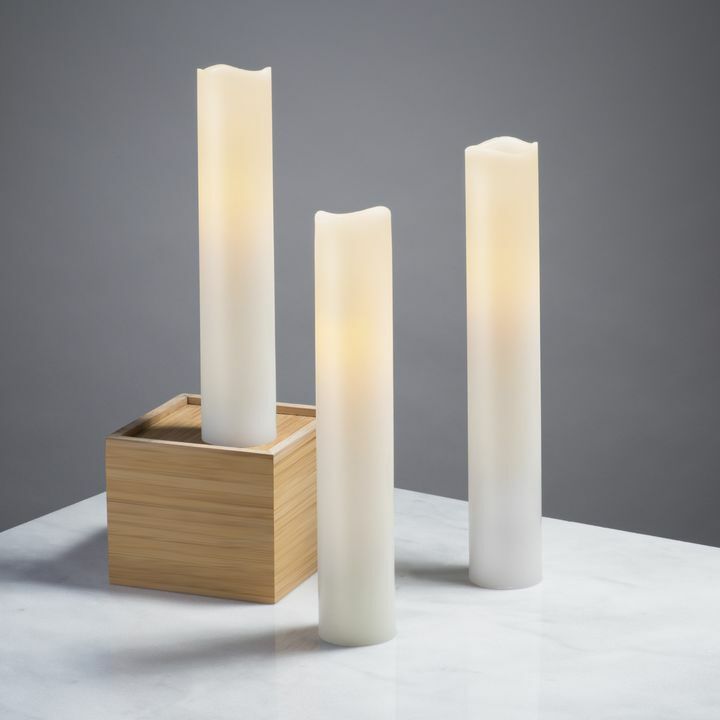 The Florence White 7" Drip Resin Flameless Taper Candles, can be turned on and off manually by turning the base counterclockwise until fully secured to turn on and to turn off you unscrew the base of the candle halfway. The remote is just for added functions like the timer or the flicker. Will the suction cups from the other tapers with silver/gold base work with these candles, and are they available for purchase separately? 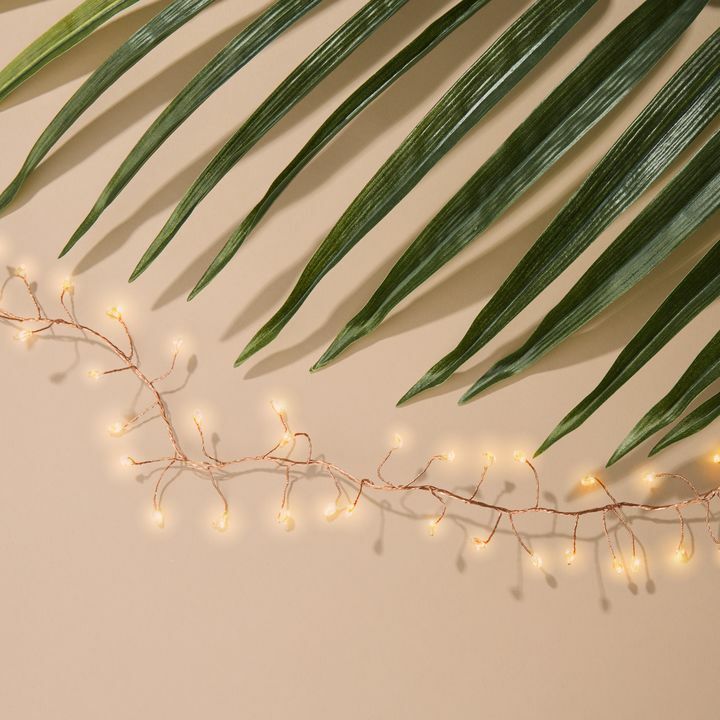 Can these candles be used outside in the summer? I want to use in a candelabra and wonder if they will melt on hot days? 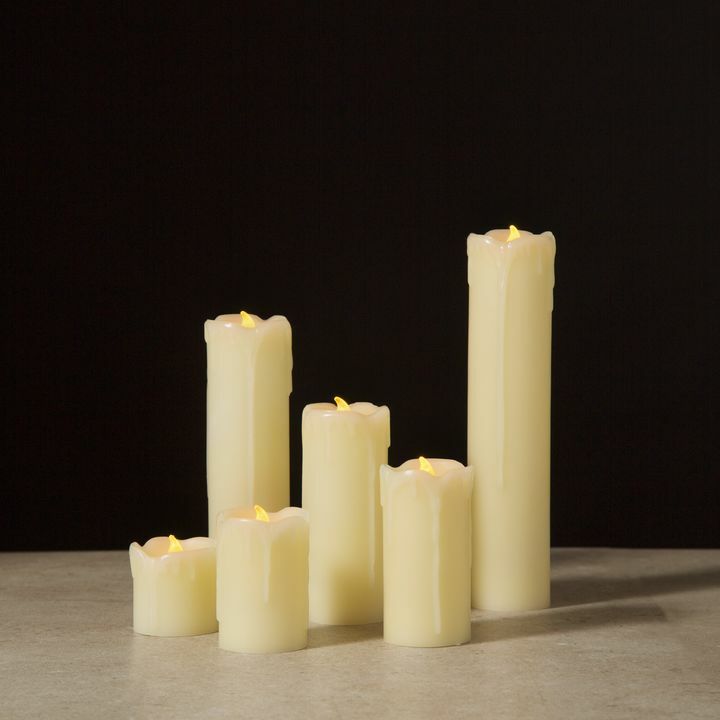 The Florence White 7" Drip Resin Flameless Taper Candles would be great in a candelabra outside. They are made of durable resin and will not melt in the heat. They are not waterproof, however- so please remember to take them in before it rains. 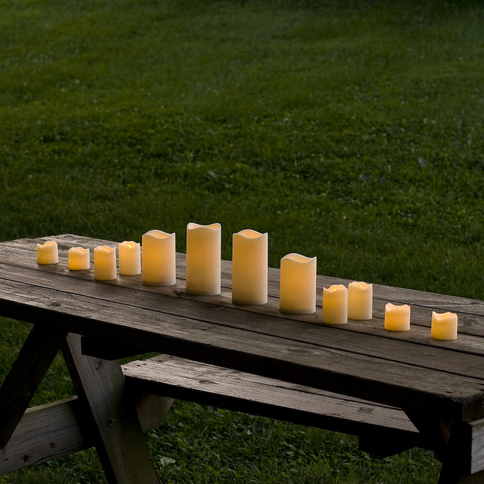 Do you offer this set of 12 7" candles with a slightly cooler light of 2200? 2700 might be too warm/yellow a light. 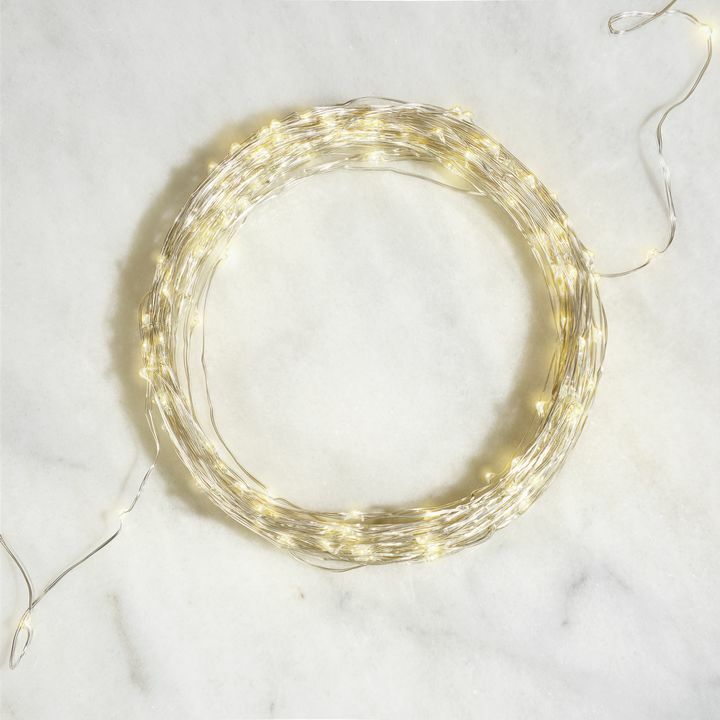 Will these fit in standard chandelier? 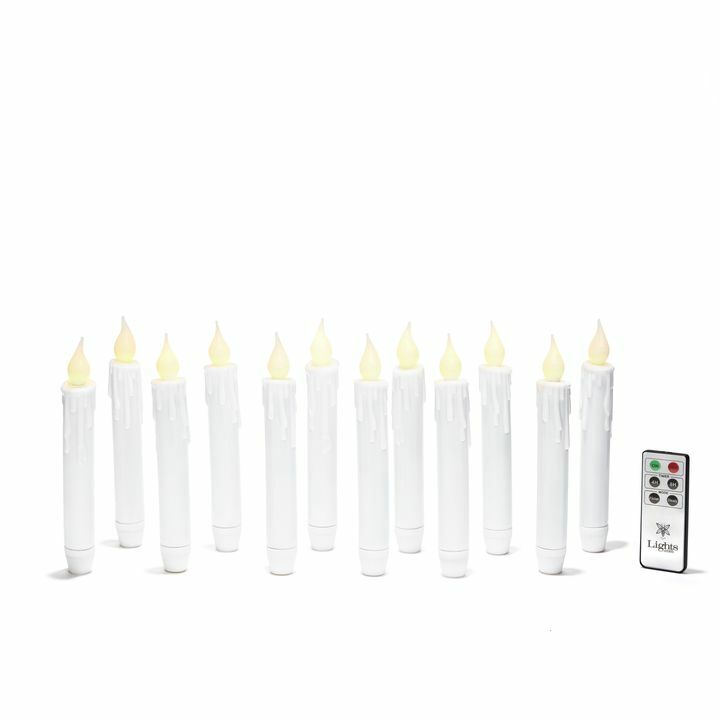 Unfortunately, the Florence White 7" Drip Resin Flameless Taper Candles, Set of 12, only comes with a light temperature of 2200K. The base size is 1" so it may fit. In the product specs it says these have a 4,8 hour timer but in the FAQ it says 6 hour timer. Which is it? The Resin Faux Drip 7" Taper Candles used to have a 6-hour timer. We recently updated and expanded the features. We added a remote control that comes with a choice of 4 or 8-hour timer. Do these have a steady light or do they flicker? 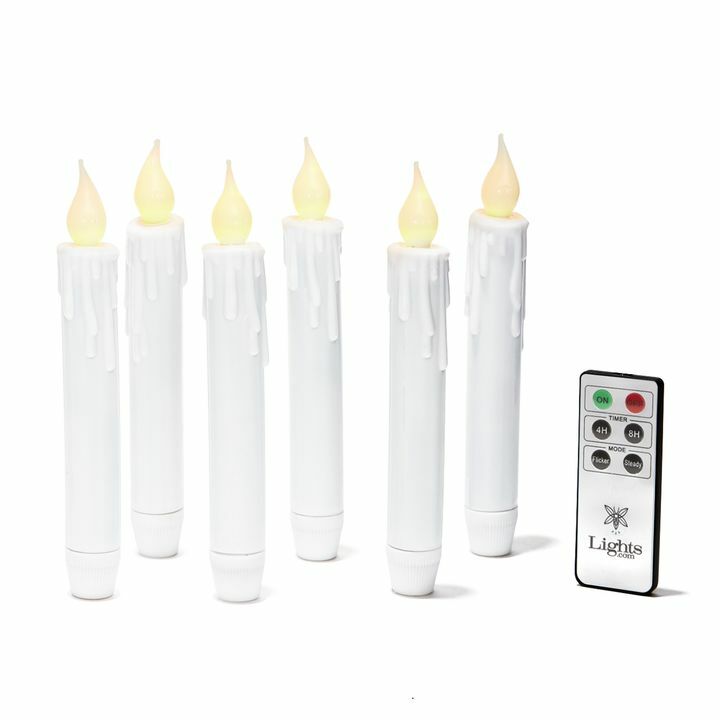 The Resin Faux Drip 7" Taper Candles come with an 8 function remote control that allows you to alternate between Candle mode (flicker) and Light mode (steady light). Is the bulb about as bright as a regular candle light? I have purchased similar candles before, and the lights were always too dim. Thanks. No, the Plastic Faux Drip 7" Taper Candles are not quite as bright as real candles. 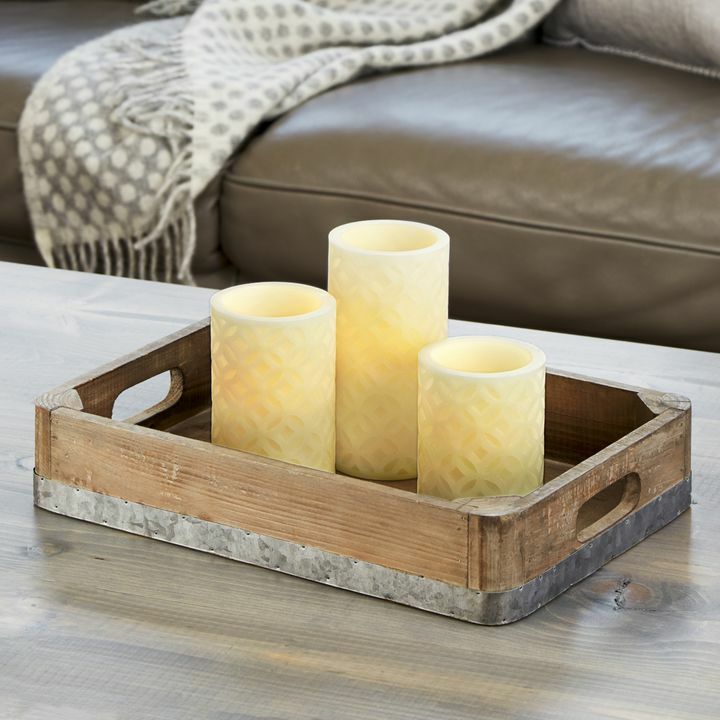 These candles were designed to be used for decorative purposes, not as a main light source. When you say that these candles have 6 hour auto timer that once set will burn continuously and daily for 6 hours. Do you mean that it will burn 6 hours and off 18 hours and then on 6 hours off 18 hours, etc? The Resin Faux Drip 7" Taper Candles have been recently updated and we've added new features. The candles now come with a remote and can be set for either four or eight hours. They'll turn off after either four or eight hours and then turn back on each night at the same time. I need an inside candle for a mausleoum. Do you have a candle/holder that can be placed on a mausleoum? We currently are not selling any candle holders. But we will have a selection of candle holders approximately by late May of 2017. Can they be used as continuous burning? 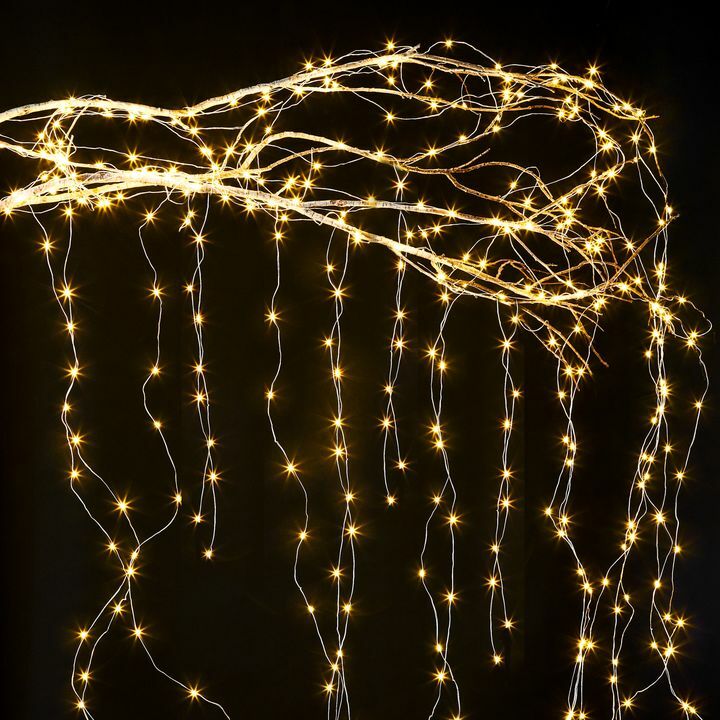 Want them for lights at a headstone - they would be completely enclosed from weather. These candles are able to continuously burn as long as you like. The remote also comes with a 4 or 8-hour timer if you would like to only have them on for a certain amount of time daily. The base size is 1 inch. They do have a clear bulb under the candle flame but the soft wax bulb cover over it, is not removable. Hello, does shipment send to Malaysia? What is the shipment fees charge is yes? We typically do not ship to Malaysia. If you have a third-party forwarder in the U.S., we can ship to them. AA batteries usually last at least 180 hours. By 6 hr timer - does it just turn off after 6 hours, or does it stay on for 6 hrs; then off for 18; back on for 6 hrs (repeat)? How do these candles turn on and off? You can twist the base of the candles to the left to turn them off OR you can turn them off with the remote. These candles do not come with candle holders. Feel free to use them for your own personal candle holders. In order to set the timer, make sure the candles are twisted to ON and with the remote, you can either select the 4 or 8-hour timer. It will turn on the same time every day after that. LLFC0008 Do they come in red? Do you sell the candle holders ? These candles do not come in red but we do sell burgundy taper candles: http://www.lights.com/burgundy-push-activated-taper-candles-with-remote-p-37688.html. We do not sell candle holders at this time but will have a selection by late May of 2017. Are these candles bright enough to put in a window to be seen from outside? These candles have a soft glow but since the light are LED, they give enough amount of light for them to be visible from the outside. Can I put colored bulbs instead of white bulbs. Do you carry colored bulbs. Thank you.